Mention insulation and many Pickering homeowners still think back to the pink fluffy sheets that were so commonly used for decades. Times have changed and so has the quality of insulation in Pickering, ON. However, if your home still has this outdated and insufficient insulation, you could be dealing with problems related to this without realizing it. Higher energy bills, drafts and even respiratory related issues can result from old insulation. 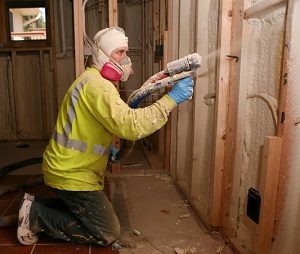 Let’s take a look at some benefits of modern insulation. Energy Efficiency – The better quality insulation you have, the better your energy efficiency will be. This means that your home will be warmer in the winter and cooler in the summer, while keeping your utility bills lower. Eco-friendly – By keeping your home more energy efficient, this also makes your home more “green.” As homeowners try to find ways to decrease their carbon footprint, this is certainly an important and responsible step to take. Indoor Air Quality – For one thing, old type of insulation more likely to create particles that get into your duct system and cause breathing issues. It is also about the fact that better insulation results in less outdoor irritants getting in like pollen. Less Ice Dam Probability – Ice dams form on roofs in spots that are cold enough for water to freeze from melting snow. Having proper insulation creates a more even temperature making ice dam formation less likely. Noise Reduction – Believe it or not, improved quality attic and wall insulation also makes it more likely for you to be able to block out some of the exterior noise around your home. This also means that the noise inside your home is less likely to bother the neighbors next door. Increase Comfort – Trying to get that temperature just right can be next to impossible when you lack necessary insulation. Once in place, you will be able to keep your home cool all summer and warm all winter with ease. If you would like to find out more about improving your home with insulation in Pickering, ON, give our pros a call. Here at 360 Roof, we take this line of work seriously. We are honored to be able to help homeowners make great changes to their home. So give us a call today to get started on insulation work or any roofing or exterior project you had in mind. As the preferred roofing contractor and exterior renovation services provider in the area, we take pride in the work we do; so you can always expect the finest quality results from our team. Whether it’s roof replacement or installing wall and attic insulation, our professionals have your home improvement needs covered. If you are looking for a professional that installs insulation in Pickering, then please call 416-360-ROOF or complete our online request form.